Following Asiwaju Tinubu’s letter to John Oyegun, the national chairman of All Progressives Congress party , APC, which he referred to Oyegun as a saboteur, Oyegun has on Friday replied him, saying that Tinubu has his full support in the discharge of his duties (resolving APC’s crisis). Recall that President Muhammadu Buhari had given Tinubu a task of resolving APC’s crisis. In the bid of doing his job Tinubu gathered that Oyegun sabotages his effort and wrote a letter to him. Based on the above allegation leveled against him, Oyegun replied therefore, “I thank you for your letter dated February 21, 2018, for your prayers and good wishes for my health. I wish you the same and pray that our good God keeps you strong and grants you His peace,” Oyegun wrote in the letter dated February 23. “It is most challenging but I believe you will ultimately justify the confidence reposed in you by Mr President. In this, you have my fullest support”, he finally wrote. 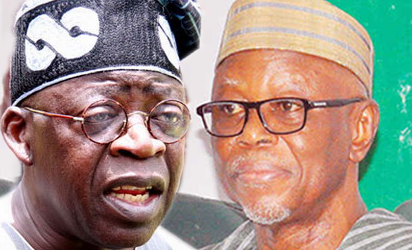 The post Oyegun replies Tinubu, says I support you to the core appeared first on Vanguard News.